By now, I think it's clear that Brady P. and I love to be outside. At this point in the summer, he's got the farmer's tan to prove it, too. The air up here is so fresh, that the breeze and sunshine are pretty much an addiction. We both feel a little anxious and groggy when we're cooped up from the rain. Then we go a little crazy. But this week has been lovely, so to the playground we went. Braeden's first trip to the Copper Harbor playground (which is really awesome, by the way) occurred in the spring of 2015. Braeden was about seven months old, and his daddy was there digging out a spot for steps to connect the lower ground to the upper ground. It was pretty neat that Dad was there because it was also B's first time on a swing, and Daddy got to push him. See that slight look of panic on his face? Yeah, his dad pushed him all right. 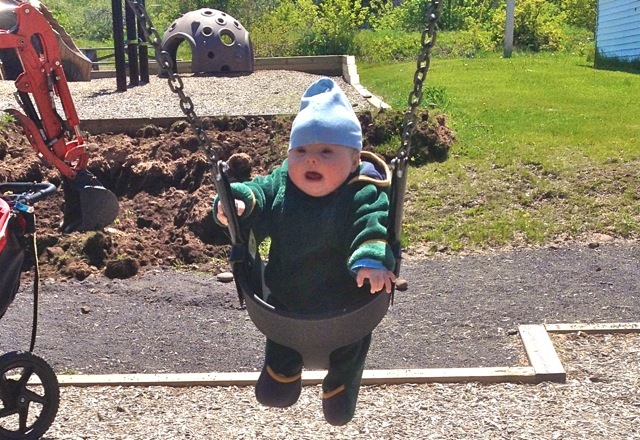 Aaron's philosophy takes everything to the extreme -- even his son's first swing ride. At least Brady P. had the instincts to hang on with one hand. These days, Braeden still loves that swing. When we get to the playground, he points to the swing first. While I push him gently, he points to the big kid swing next to it and says, "Eh!" That means he wants me to swing beside him. So I push him to the count of three then jump on the next swing and pump as high as he is going. "We're swinging together, Brady P!" I shout. He laughs because he loves it so much. When he's done with the swing, he'll point to the ground to get down or the slide -- his next favorite feature. I am so proud that Brady P. can climb up the four steps, shimmy onto the slide, push himself down and land safely in the wood chips all by himself!!! I am there to spot, of course, but he is totally autonomous with the little kid slide. He learned it this spring. I couldn't wait to show Grammy Linda when she came up this summer. But Brady P. had something else to show her the last time they were at the playground together. I was somewhere else at the time, but she had a story to tell when I got home. Grammy sat down at the bottom of the little slide with her feet in the wood chips. Braeden, who likes to command people's body parts, pushed her torso down, so she was laying halfway up the slide. When she lifted her head to laugh at him, he pushed it back down. Then he climbed up the steps. Grammy popped her head back up to make sure he was ascending safely. When he saw that maneuver, do you know what he did? He shook his head, descended the steps in a huff and pushed her head back down. Then he climbed back up the steps. Well, Grammy thought that was so funny that she popped her head up again. Sure enough, he shook his head with his little throat gurgle sound, got down and pushed her head back onto the slide. Grammy was laughing so hard, but Braeden didn't think it was funny. Oh, no. He wanted her to lay perfectly still until he got to the top, so he could slide down onto her head. What a stinker. Finally, she let him finish climbing, and, sure enough, he slid down onto her head and giggled. Then they both slid down the rest of the way, and he made her lay down again so they could play his little game some more. That little boy. He definitely has preferences and ideas and doesn't like deviating from them, especially if it's not his idea. But it's the little things like that that show us how much he is learning and developing each day. He is his own person, and we are grateful for him in our lives. Your blog is so well written and gives me hope that when/if we make the final decision to move up there that there are like-minded people I can connect with. This will make the decision much, much easier as it is one of my biggest worries. If you would'nt mind me picking your brain about the community up there I would love to connect! Hey Jana! You can find me at amandak114 at yahoo.com. I'd love to chat!